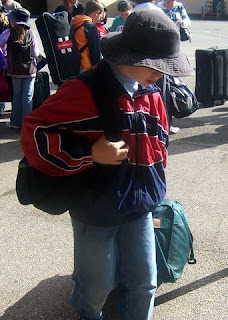 Aaron left for his first school camp today, along with 113 or so other kids. They have gone up to the Adelaide Hills and will be back Wednesday afternoon. Although it's his first camp with the school I kinda feel that this is going to be a picnic for him after some of the camps that he has been on with Cubs and Scouts, particularly the hike that he has just finished, but he was still very excited. Nothing quite like going away with all of your friends from school, just having a blast of a time. 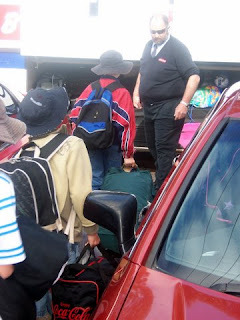 There was a small hiccup this morning with the bus arrangements, apparently where they are staying arranged the buses to pick the kids up and they only organised two buses, when they needed three. It just so happened that Aaron's class was left standing waiting for the third bus to arrive, which did finally come some 20 minutes or so after the other two buses left. I was quite impressed to see that seat belts had been fitted. 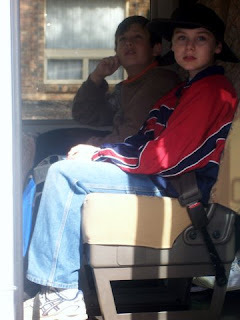 Aaron was a little concerned about his gear being on one bus and him on another LOL. He went and checked out the rego number of the bus that had his bag on it, just so that he knew when he got there which bus to go to, to get it. I thought that was quite smart, actually. LOL. And when he gets home on Wednesday there will be a mad rush to wash everything and pack it all again for Friday night, when he and his sister head off for another Scout Camp on the weekend. I tell ya the kids have darn good social life LOL, better than mum and dad!!! My oldest Son Hayden is about to start Joey Scouts soon. Turns 6 in November and he can't wait. He has been camping with us since he was about 6months old through the Scout Radio Activities Group ( also known as SRAG) so he will look forward to going to camp too. I guess its just trying to get me to stay away to let him go by himself. The Joey Scout Leader I used to be keeps coming forth. But Have to hold back for now not ready to doen the uniform just yet. lol. One day.